The boys are back, those guys from Jersey that is and they are hotter and harmonize better than ever before. New Haven’s Shubert Theater will be hopping and bopping with their great 1960’s rock and roll sounds until Sunday, October 7 and you need to bear witness to this musical phenomenon. “Jersey Boys” is the story of Frankie Valli and his group The Four Seasons and their rocky road to stardom, with and without the chocolate ice cream, walnuts and marshmallows that frame the popular dessert. Coined a jukebox musical, it has won Tonys and Grammys and has music by Bob Gaudio, lyrics by Bob Crewe and book by Marshall Brickman and Rick Elice. The story is divided into four parts, seasons if you will. Spring is Tommy DeVito (Colby Foytik,Stephen Cerf), who in between stints in prison, tells the tale of the band’s founding, with himself at the helm. Beginning as “The Variety Trio,” the group would change it name and its membership as quickly as a bee sips nectar from a buttercup. The discovery of teenage heartthrob Frankie Castelluccio, who was soon to change his name to Valli, helped the struggling group but didn’t solve its problems of reaching stardom. The advent of singer/songwriter Bob Gaudio,(Jason Kappus) the season of summer, helps solidify their sound and thanks to a bowling alley of the same name, they settle on “The Four Seasons.” Bobby, still a teen himself, writes them a trio of tunes, “Sherry,” “Big Girls Don’t Cry” and “Walk Like a Man,” that get them noticed and heard nationally. The constant road tours cause Frankie’s marriage to Mary (Natalie Gallo) to dissolve and Tommy’s reoccurring gambling debts take a serious toll on the group’s rising success. Enter fall and it’s Nick Massi’s (Brandon Andrus) turn to tell his version of the story. Gaudio is so busy writing great songs, he ignores the troubles that are so evident in their day-to-day functioning. The friendships are strained to the breaking point by Tommy’s poor choices with the mob and the IRS and Frankie steps up to cover his debts. By the time Frankie ((a role shared by Brad Weinstock and Hayden Milanes), as winter, takes over the narrative, the band has incorporated new members to cover for Nick and Tommy who leave, but the seams have permanent cracks. Their induction in 1990 into the Rock and Roll Hall of Fame reunites the group for one last memorable moment. For tickets ($50 and up), call the Shubert Theater, 247 College Street, New Haven at 203-562-5666 or 800-228-6622 or online at www.shubert.com. Performances are Tuesday to Thursday at 7:30 p.m., Friday at 8 p.m., Saturday at 2 p.m. and 8 p.m. and Sunday at 2 p.m. and 7 p.m. Bring a non-perishable food item for the New Haven Food Bank. Let four guys from the wrong side of the tracks in the Garden State dazzle you with their fancy footwork, amazing harmony and honey-dipped sounds. When you think of the upcoming elections for president, and the candidates, you might find yourself in a pickle. Selecting between a sweet gherkin or a kosher dill is an easy matter, but the presidential race is littered with decisions a delicatessen doesn’t prepare you for making. Enter the drag queens and beauty shop quartet Kinsey Sicks to the rescue. They want you to vote, probably as often as possible, and they don’t mind going the extra yard or mile to get you to the voting booth. For one night only, Saturday, October 13 at 8 p.m., this highly unusual foursome, probably draped in red, white and blue, will be parading politically, but not necessarily correctly, on stage of the Annex Club, 554 Woodward Avenue, New Haven as a fundraiser for the Connecticut Gay Men’s Chorus. Hitting the campaign trail in knee high boots and fashion finery, these “ladies” will sharpen their incisors on the timely matters at stake in Washington, D.C. Nothing will be sacred as they satire and sing about today’s political arena, and there will be no referees in sight. Spouting original material like “Sell the Poor,” “Eliminate the Schools” and their campaign anthem “Vote for Me (I’m Not from Kenya),” they will present their show “Electile Dysfunction,” still hot from their recent tour stop in Tampa at the Republican Convention. 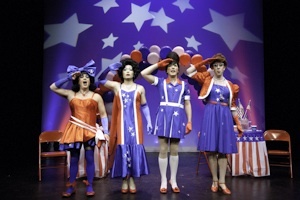 These divas in drag will call upon four-part harmony to serenade about such pressing issues as immigration, unemployment, education, scandal and corruption, all while waving the American flag. For tickets ($30, table with reserved seating $40), call the CGMC at 800-644-2462 or online at www.ctgmc.org. A cash bar and food will be available on site. Please don’t bring in any outside food or drink. 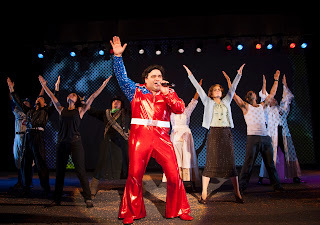 Some hear “Rachel” (Ben Schatz), “Winnie” (Irwin Keller), “Trixie”: (Jeff Manabat) and “Trampolina” (Spencer Brown) rhapsodize in four-part harmony about who to vote for in November. Comic and impressionist Rich Little has been labeled “The Man of a Thousand Voices” and if you stopped to count his incredible impersonations it is probably a most accurate nickname. He started out in Canada as an usher in a movie theater, standing in the back of the house perfecting his voices, then started acting and using his skills as a disc jockey on the radio. For the last five decades, he has been a frequent guest on television on variety shows, starring in HMO specials and night club acts, most often in Las Vegas where he lives. To see Rich Little, plan to attend his one-man show “Jimmy Stewart and Friends” on Saturday, September 29 at 8 p.m. at Sacred Heart University’s Edgerton Center for the Performing Arts as part of its American Legends Series. Mr. Little will be on stage with more than two dozen of his iconic characterizations, from John Wayne to Frank Sinatra, George Burns to Ronald Reagan, Cary Grant to Katherine Hepburn. Don’t be surprised if a few unlikely guests pop in, like Kermit the Frog, Jay Leno, Dr. Ruth, Edith Bunker and Robin Williams. 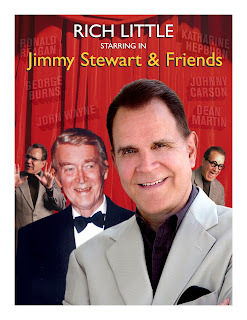 Together they will tell the story of famed actor Jimmy Stewart in the unique and outstanding way only Rich Little is capable of creating. In his long illustrious career, Little keeps adding new impressions to keep his act fresh, like D. Phil, a recent add-on. Politicians have long been his meat and potatoes, with former presidents Bill Clinton and George W. Bush keep providing him excellent material. His favorite politician is Ronald Reagan, although he is best known for his President Nixon impersonation. When he is doing Andy Rooney, he asks annoying questions like “when you choke a smurf what color does it turn?” and when he is doing Johnny Carson he thinks of ostriches. For tickets ($25, senior $15, student $10), call the Edgerton Center on the campus of Sacred Heart University, 5151 Park Avenue, Fairfield (exit 27 off the Merritt) at 203-371-7908 or online at www.EdgertonCenter.org. Come meet Jimmy Stewart and his dozens of good friends courtesy of that master of mimicry Rich Little. In the coveted world of today’s top female journalists, Lesley Stahl enjoys a prominent place of respect and authenticity. She has long ago broken the proverbial glass ceiling, beginning her illustrious career at the age of 30 in 1972 when she was hired by CBS News, on the same day affirmative action was established. Ms. Stahl spoke Wednesday night September 19, 2012 at the Quick Center on the campus of Fairfield University as part of its Open Visions Forum, sharing her insights, to a packed house, of decades in the political arena in general and in the upcoming presidential election in particular. As one of the best broadcast journalists, with forty years of political experience, she feels energized by the current events. Despite polls to the contrary, she believes the “upcoming debates are crucial” and hopes Americans will be watching to judge the candidates for their competence, leadership and likeability. Stahl says this despite believing that the candidate, Obama or Romney, who is ahead before the debates always wins. 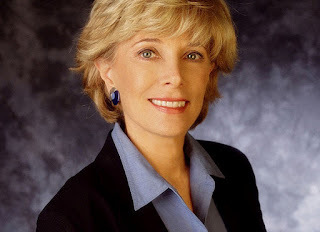 As a good newspaper woman, Lesley Stahl knows two things about the upcoming elections: “A lot can happen in fifty days “ and “The race is tight and anyone can bounce back.” She hopes the American people will tune in and make informed choices. Billy McGuigan is a musical phenomenon, one who can morph himself into Buddy Holly or the Beatles in a snap of his talented fingers. You have the opportunity to witness these magical transformations for the next two weekends courtesy of Waterbury’s Seven Angels Theatre. It’s clearly a case of be there or be square. First up is “Rave On! The Buddy Holly Experience” on Friday, September 21 and Saturday, September 22 at 8 p.m. where McGuigan not only sounds like the late, great rock n’ roller but looks like him too. As a tribute concert, it’s electric, energetic and exciting. With his Rave On Band behind him, Billy McGuigan will belt out the hit tunes that made Buddy Holly a meteor that burned bright and fast until his tragic death, too young but not forgotten. Come hear “Peggy Sue,” “That’ll Be the Day,” “Oh Boy,” “Raining in My Heart,” “It’s So Easy” and “Rave On.” In the process, homage is paid to the legendary peers who accompanied him into rock n’ roll heaven, like Elvis, Jerry Lee Lewis, Chuck Berry, Ritchie Valens and The Big Bopper. The following weekend, Friday, September 28 and Saturday, September 29, The Beatles will take the stage, thanks to McGuigan’s enthusiastic genius, with electric guitar, drums and keyboards. The emphasis in on the music, pure and honest. In “Yesterday and Today,” you, the audience, pick your favorite Beatles song and tell why and have Billy create a unique experience just for you, like your own personal concert. Fill out a card pre-show and list such songs as “Revolution,” “Hey, Jude,” “Yellow Submarine,” “Love Me Do,” “Hard Day’s Night,” “All You Need is Love,” “Strawberry Fields Forever,” “Penny Lane” and the list goes on. You select and Billy and his brothers will take it from there to the stage. For tickets ($47.50, subscribers $42.50), call Seven Angels Theatre, Plank Road, Hamilton Park Pavilion, Waterbury at 203-757-4676 or online at www.sevenangelstheatre.org. “JERSEY BOYS” OH, WHAT A NIGHT! You won’t be able to take your eyes off of the sensational, harmony-driven lads from New Jersey who will rock the rafters of the Shubert Theater in New Haven for almost two solid weeks of musical fun, Tuesday, September 25 to Sunday, October 7, when the smash 2006 Tony Award winning show “Jersey Boys” bounces into town. Follow four guys from the Garden State who have to make tough choices on their rocky road to fame and fortune. 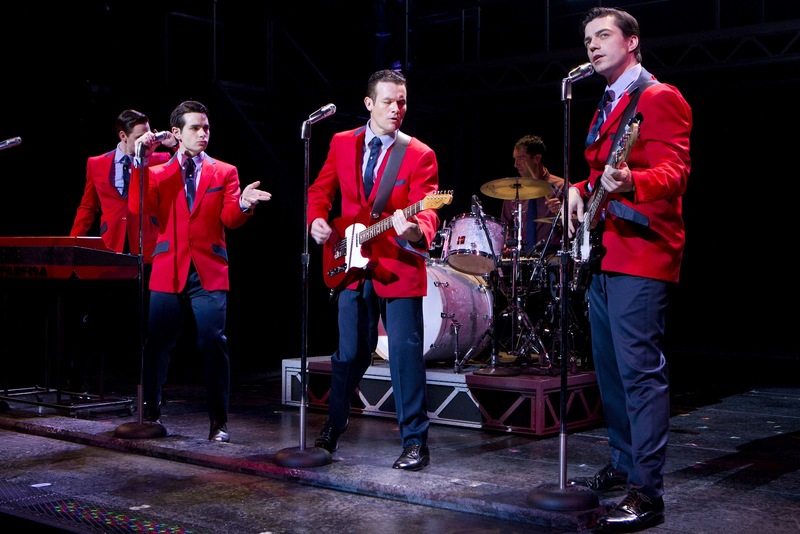 With book by Marshall Brickman and Rick Elice, and music by Bob Gaudio and lyrics by Bob Crewe, “Jersey Boys” tells the tale of how Frankie Valli becomes lead singer of The Four Seasons. With a sweet, honey-dipped sound and a dazzling dream, these young kids flirt with crime and the wrong side of the law but, ultimately, set their careers straight towards stardom. Finding members who fit their sound was the first hurdle. Claiming a name that suited their voices was the second. Avoiding arrest by the cops, reconciling family life with long stints on the road, a gambling addiction and burden of debt all conspire to almost bring them down. But Frank Valli (a role shared by Brad Weinstock and Hayden Milanes), Bob Gaudio (Jason Kappus), Tommy DeVito (Colby Foytik) and Nick Massi (Brandon Andrus) persevere and go on to sell 175 million records worldwide, all before they hit thirty, with Gaudio and Bob Crewe, their producer/lyricist writing many of the show’s thirty three songs, including five #1 hits and 11 that made the Billboard’s top ten. For tickets ($50 and up), call the Shubert, 247 College Street, New Haven at 800-228-6622 or go online to www.shubert.com. Performances are Tuesday – Thursday at 7:30 p.m., Friday at 8 p.m., Saturday at 2 p.m. and 8 p.m. and Sunday at 2 p.m. and 7 p.m.
Let a quartet of talented guys from Jersey adore you with their eyes and serenade you with their great voices as they work their way into your heart. Oh, what a night! Tony Bennett, a painter as well as a singer, compares Everett Raymond Kinstler to John Singer Sargent. 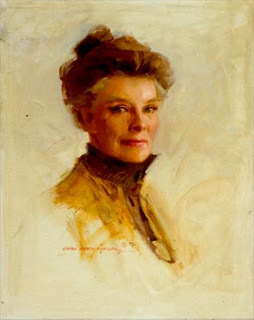 “Kinstler is that good.” Starting out at age 16 as a comic book illustrator, Kinstler has painted portraits, 1200 in all, including seven presidents, from Nixon to the Bushes, as well as college presidents, senators, governors and well - known personalities, from John Wayne to Katherine Hepburn to Carol Burnett and Paul Newman. has a one-man exhibit of his work “Pulps to Portraits” currently at the Bellarmine Museum on the campus of Fairfield University in Fairfield through September 28, 2012. He will speak about his work at 5 p.m. on Thursday, September 20 at 5 p.m., followed by a reception at 6 p.m. at the Bellarmine. The exhibit is free and open to the public, and was organized by the Norman Rockwell Museum in Stockbridge, Massachusetts. Go to www.everettraymondkinstler.com to see examples of this wonderful painter’s extensive body of work, how he infuses his subjects with his passion for telling a story. For a Rice Krispie Treat that is sweet, crunchy and tasty, with a recipe that is clever, irreverent and fun, look no further than the latest offering at Spirit of Broadway Theater in Norwich. From now until Sunday September 30, you are invited to sit in at all the backroom drama and comedy and free-for-all nonsense as well as the blood, sweat and tears that go into writing a musical for Broadway in the new millennium. 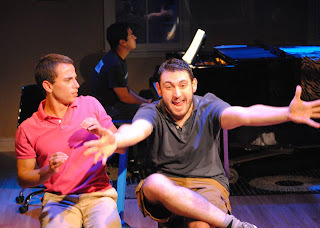 Hunter Bell and Jeff Bowman, with a little help from female friends, are challenged to write a musical for the New York Music Festival, with only three short weeks to meet the deadline. The result is the ambitious, frenetic, fast-paced and forward thinking (title of show). The name refers to the space at the head of the application where title of show belongs. Not only do these two collaborators/composers win the contest, they take their show to off-Broadway and then, to that most sacred of all places, Broadway…and we, the audience, get to go along for the bumpy ride. 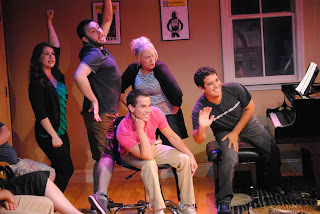 Hunter, creatively and manically drawn by Corrado Alicata and his bosom buddy Jeff, a dedicated and determined Paul Lietz, enlist the aid of two show business friends Heidi, a bubbly Shauna Goodgold, and Susan, a happily neurotic Jessica Ferrady, to meet their goal. With a trusty silent partner Larry, a talented Dan Brandl, on piano, the quartet decides to write a musical about…writing a musical. They drop names and plays like gumdrops on the forest floor, allude to everything from monkeys to Mame to Marcel Marceau, and to Shrek, Shakespeare, Sondheim, sequins and Sedaris, pay homage to Wonder Woman and Broadway and even sing a crazy and delightful song about Vampires, and dead ones at that. Brett Bernardini expertly directs this mad, musical romp that went on to receive a Tony Award nomination in 2009 for Best Book of a Musical. For tickets ($30, college students with ID $25, students $20), call Spirit of Broadway Theater, 24 Chestnut Street, Norwich at 860-886-2378 or go online to www.spiritofbroadway.org. Performances are Wednesday and Thursday at 7 p.m., Friday and Saturday at 8 p.m. and Sunday at 2 p.m. Discover for yourself the magic formula as well as all the hard work, creativity and genius that go into the penning of a successful show. OMG! Get your jazz hands ready! As the daughter of a distinguished general, growing up in a privileged environment, Hedda Gabler is accustomed to getting her own way. Used to ruling by manipulation, she enjoys ridiculing those she views as inferior to her and likes being amused at their expense. Feelings of boredom and a vast need for freedom fuel her everyday existence. Her beloved and bizarre collection of pistols gives her the sense of danger she craves to experience. To become intimately acquainted with this unique and utterly disturbing creature, attend an unforgettable performance of Henrik Ibsen’s “Hedda Gabler” at the Hartford Stage until Sunday, September 23. As a psychological study, Hedda Gabler is an enigma, one that verges on the edge of madness. Roxanna Hope is brilliant as the conflicted female who can’t find her place in society as she experiments with the role that best serves her needs. She is inspired and discontent, excitable and filled with disdain, highly emotional and easily distraught. She burns to make a difference, to direct the destinies of those around her, even if they are destroyed in the process. Returning from a six month honeymoon with her mild, admiring professor husband George (John Patrick Hayden), Hedda is dismissive and critical of his loving Aunt Julia (Kandis Chappell) and has no use for her new servant Berte (Anne O’Sullivan) who has served George’s family for years. Her interactions with an old school acquaintance Thea (Sara Tophorn) whom she tormented in their youth and with a former lover Eilert (Sam Redford) reveal her true evil inclinations, her jealous streak and her inability to recognize happiness. Judge Brack (Thomas Jay Ryan) is the only one in her world capable of calling Hedda’s bluff and revealing her self-destructive center. Jennifer Tarver directs this turn of the twentieth century drama, set in Norway, with a new adaptation by Jon Robin Baitz, in a bold and decisive manner. For tickets ($56.50-93.50), call the Hartford Stage, 50 Church Street, Hartford at 860-527-5151 or online at www.hartfordstage.org. Performances are Tuesday to Thursday and Sunday at 7:30 p.m., Friday and Saturday at 8 p.m., with matinees Sunday and selected Wednesdays and Saturdays at 2 p.m. The theater is introducing a Stage Pass for 18-27 year olds for the season for only $38, only until September 22.. Call the box office. Come view the master puppeteer Hedda Gabler as she realizes her beauty is not a gilt-edged ticket to a forbidden world and, ultimately, she has no power over anyone’s destiny, least of all her own. An eager and enterprising window washer, one J. Pierrepont Finch, feels he is destined for greatness in the corporate world. 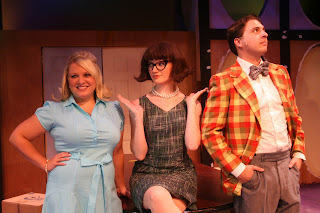 To achieve his goals, he follows to the letter the advice dictated by a book entitled “How to Succeed in Business Without Really Trying.” That book and his story are being delightfully revealed by the Stage II Community Production at Waterbury’s Seven Angels Theatre the weekend of September 14-16. With the World Wide Wicket Company as his canvas, Vincent McCoy’s Finch is focused on the big desk in the large corner office, the one currently occupied by the company president J. B. Biggley (Jeff Savage). Starting in the mailroom, Finch doesn’t object to being on the lowest rung of the ladder, as long as he ultimately reaches his goal. He is the proverbial Jacob climbing the ladder to heaven, and he will dispense with all those, the proverbial angels, perched to stand in his way. Vincent McCoy is deliciously ambitious and cleverly humble, portraying Finch with a touch of humility and a whole lot of good natured generosity. By his side the whole way is his new girlfriend/secretary/soon-to-be wife Rosemary, a supportive and sweet Laura Solocius, who boosts his rise to success at every step. The other women at the company, like Smitty (Trisha Carr) and Miss Jones (Suzanne Powers) also help Finch along while he almost get detoured from his aims by the sexually scheming Hedy La Rue, a vivacious Jeannine Gallmeyer, and the boss’s nephew Bud Frump, a devilishly conniving Ian Galligan, who wants to beat Finch at his game. Tom Chute, who doubles as the voice of the book, directs this talented cast who bring this Frank Loesser musical to wonderful life. Their rendition of “Brotherhood of Man,” with clever choreography by Jessica McCuiston and musical direction by Sean Lewis, is a show stopper. For tickets ($25, season subscribers $20), call Seven Angels Theatre, Plank Road, Hamiliton Park Pavilion, Waterbury at 203-757-4676 or online at www.SevenAngelsTheatre.org. Performances are Friday and Saturday at 8 p.m and Sunday at 2 p.m. A portion of ticket sales goes to WATR Sunshine Fund for Kids to help needy families. Come enjoy and believe in a large local cast as they have a lot of fun creating Finch’s amazing ascent up the corporate ladder in this Pulitzer Prize-winning Broadway musical. The definitions of what constitutes a marriage and a family have been much in the headlines recently. Politicians have weighed in on all sides. 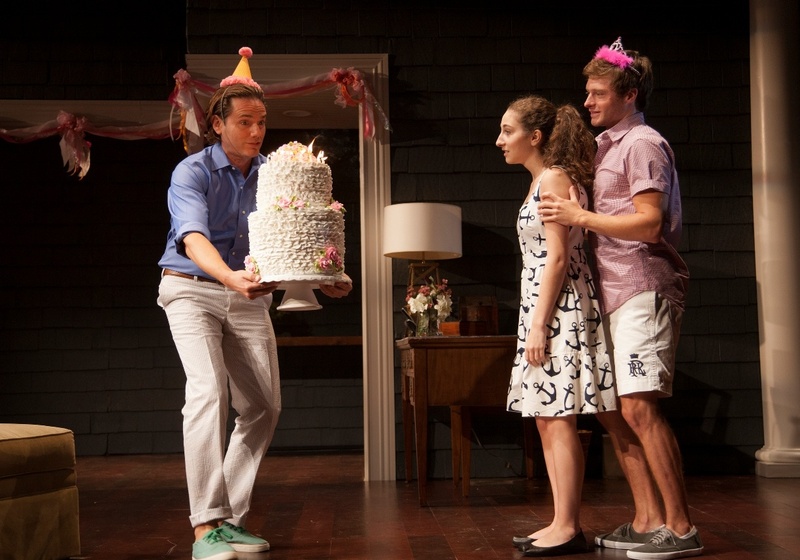 In Chad Beguelin’s world premiere play “Harbor,” he reflects on the homosexual realm he inhabits with a melodramatic, soap opera comedy he sets in Sag Harbor, a wealthy, privileged area of the Hamptons, on Long Island. “Harbor” revolves around the lives of Kevin and Ted who have lived together, married, in superficial happiness, for a decade. 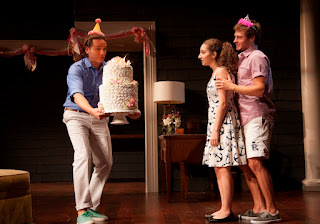 Their cohabitation will be examined and laid bare on the stage of Westport Country Playhouse until Saturday, September 15. Kevin (Bobby Steggert) has been struggling for years to write a novel, being cuddled, coddled and enabled by his lover Ted (Paul Anthony Stewart), an architect, who because of the economy, is finding it harder and harder to get commercial assignments. While they are not suffering financially yet, they are beginning to feel the pinch. Their idyllic life, at least on the surface, is interrupted irrevocably by a phone call from Donna, Kevin’s estranged sister. Donna is a kooky, free spirit who travels the country in a van with her precocious teenage daughter Lottie, never building a home, or even a nest, for them to share. Kate Nowlin’s Donna, with a sharp mouth and unlikable manner, is ready to foist herself and Lottie into Kevin and Ted’s comfortable home, ready or not, without an invitation or a life jacket. Donna has a special agenda and she works hard to get her points across and her desires known. Her suggestion, which borders on a demand, causes Kevin and Ted to reevaluate their relationship. The only one who is truly an adult in this confrontation is Lottie who knows what she wants and needs and works honestly to make it a reality. Alexis Molnar captures her portrayal perfectly. To call this a comedy is stretching the humor. There is too much angst and emotional storms that shatter any illusions about happily-ever-after endings. Director Mark Lamos encourages these talented actors to be candid and revealing, on an inviting set designed by Andrew Jackness. For tickets ($30 and up), call Westport Country Playhouse, 25 Powers Court, Westport, off route 1, at 203-227-4177 or 888-927-7529 or go online to www.westportplayhouse.org. Performances are Tuesday at 8 p.m., Wednesday at 2 p.m. and 8 p.m., Thursday and Friday at 8 p.m., Saturday at 3 p.m. and 8 p.m. and Sunday at 3 p.m.
Help Kevin and Ted, Donna and Lottie, reevaluate their roles in each other’s lives, their responsibilities and obligations, as they determine what family means. Imagine you are a world famous playwright who has had a string of successes. Further imagine you’ve hit a dry spell when new ideas languish in a wordless desert, while your finances dry up just as quickly. What might you do to refill your reservoir? What lengths might you go to if you felt desperate? 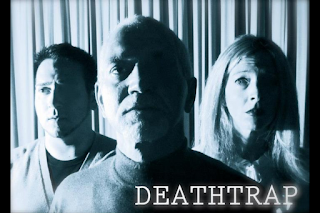 Come meet Sidney Bruhl of Westport, Connecticut in Ira Levin’s thriller “Deathtrap” playing weekends until Saturday, October 6 at Berlin’s Connecticut Cabaret Theatre. To add a little angst to the proceedings, this is the first mystery Ct. Cabaret Theatre has ever mounted and it was the longest running comedy-thriller of all time on Broadway. Get ready to scream, and laugh, as Sidney Bruhl works to get his literary edge back. Plays that swirl with mystery are difficult to craft, as he well knows, having written a string of flops. 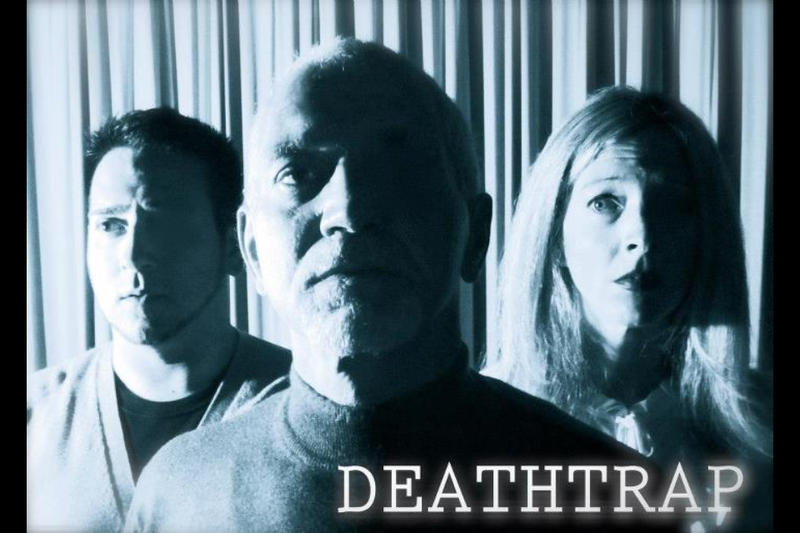 What he needs is a juicy plot, with one set, and five characters and it falls into his lap when a former student, Clifford Anderson, sends him his first play for Bruhl to evaluate. Len Fredericks’ Sidney Bruhl is devious and inventive and willing to go to any lengths to get what he wants: a prize winning play, to restore his sagging fortunes and put his name back in the spotlight. With the encouragement of his wife Myra (Rachel West-Balling), he hopes to get Anderson’s consent to collaborate, to reshape and sharpen the script or to at least get a referral fee for finding it a producer and act as Anderson’s agent. Matthew Collin Marrero’s Anderson is not as naïve and trusting as Bruhl would wish. He is not willing to sign away or even collaborate on “his baby” and the plot thickens. Adding to the bouillabaisse of suspense, a psychic Helga ten Dorp, cleverly portrayed by Karen Buck, moves in next door and “sees” much more than she should while Bruhl’s attorney Porter Milgrim (Dave Wall) is also too observant for his own good. Artistic director Kris McMurray keeps a firm hand on the swords, crossbows, revolvers and garrotes as this roller coaster ride goes in exciting and unexpected directions. For tickets ($30), call CT Cabaret Theatre, 31-33 Webster Square Road, Berlin at 860-829-1248 or online at www.ctcabaret.com. Performances are Friday and Saturday nights at 8 p.m., with doors opening at 7:15 p.m. Remember to bring goodies to eat at your table or buy desserts and drinks at the concession stand on site. Expect surprises as you learn firsthand the lengths a playwright will go to in order to achieve fame and fortune…perhaps even murder. 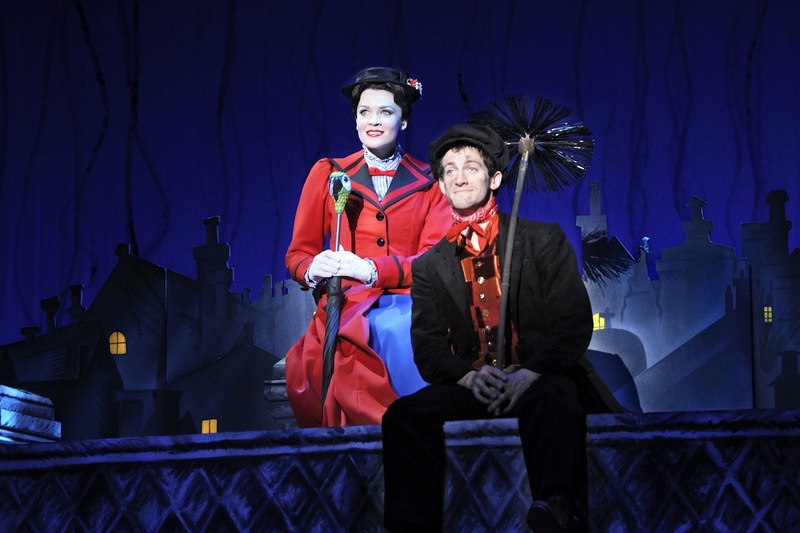 The Bushnell Center for the Arts in Hartford will open its roof and rafters to welcome the Disney and Cameron Mackintosh national tour of “Mary Poppins” from Friday, September 14 to Sunday, September 23 and you’re invited to hold on to her umbrella for a bucket of fun. To get in the proper spirit, the Bushnell is offering a free family Block Party on Saturday, September 8 from 11 a.m. to 3 p.m., with opportunities to make and fly a kite, hear the great show tunes, learn a show dance, see a chalk muralist Tracy Lee Stum create a 3D vision of the characters, attend a 1 p.m. Sing-Along version of the film and much more. As nannies go. Mary Poppins is one of the magical best. Hailing from England, she unexpectedly arrives at number Seventeen Cherry Tree Lane when the Banks family is in desperate need of her services. A strong wind delivers her, carpetbag in hand, to the home of Mr. and Mrs. Banks and their children Jane and Michael. Flying in with an umbrella is only one of her fanciful feats. Jane and Michael Banks are thoroughly terrible and have chased their current nanny right out the door. Mere minutes after the children pen their advertisement for a new one, sung delightfully as “The Perfect Nanny,” who should arrive but Mary Poppins. Here is a woman who can make statues come to life, whose best friend is a chimney sweep named Bert, who can befriend unusual people like a Bird Woman and a lady who runs a magical sweet shop and who can encourage toys to dance. While trying to teach the children life lessons, Mary P. inadvertently puts their father’s job at the bank in jeopardy. But, never fear, all will come out right in the end. For tickets ($20-75), call the Bushnell, 166 Capitol Avenue, Hartford at 860-987-5900 or online at www.bushnell.org. Performances are Tuesday-Saturday at 7:30 p.m., with matinees Saturday at 2 p.m. and Sunday at 1 p.m. and 6:30 p.m.
when a most amazing Mary Poppins has the spoon and the magic firmly in hand.